The colours of flowers are often what attracts people to a particular bouquet or arrangement, but there is more to colours than simply pleasing the eye. Flowers have long held a language all of their own, and the colours of flowers is fraught with meaning. Rose colours in particular convey messages, but the colours of all flowers can be used to communicate deeper meanings as well. Roses are perhaps the best known flower for which the meaning of a bouquet or arrangement changes depending on the colour of the flowers. 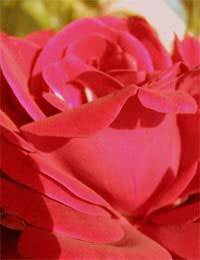 Red roses typically convey true love and/or passion while deep red or crimson roses speak of commitment. Yellow roses are best known to represent friendship and freedom. Pale pink roses communicate gentleness, light pink roses communicate fun and deep or dark pink roses communicate thanks. Peach roses convey appreciation and/or sympathy while orange roses convey enthusiasm. Coral roses are an obvious message of desire, and white roses broadcast a message of innocence and/or truth. Lilac roses represent enchantment while purple roses represent magnetism and majesty. Roses which are artificially coloured, such as bright blue or black, carry an untraditional message that is often unique to those who arrange or send them. However, all of these messages can be overwritten by the health of the blossoms - particularly if the roses are decaying or dead. This type of bouquet or arrangement conveys a clear message that the recipient is no longer cared for, and that the relationship between the sender and recipient is most likely finished. Aside from roses, other flowers have a special colour language as well. Blue flowers are often used to communicate calm, peace and tranquility as well as confidence and intelligence. Hydrangeas, blue irises, hyacinths and delphiniums are all typically regarded as blue flowers. Purple flowers, the traditional colour of royalty, send a message of majesty, dignity and pride. Examples of purple flowers include tulips, lilacs, freesia and gladioli. Light purple flowers, such as lavender, also represent grace and elegance. Green flowers are most representative of nature and convey a message of health and youth. Jade roses, green hydrangea, herbs and greenery are all common additions to green arrangements. Yellow flowers, such as chrysanthemums, roses, sunflowers and daffodils, are representative of joy and friendship. Orange flowers take this message a step further to convey a message of enthusiasm and energy. Roses, calla lilies and gerber daisies are all common orange flowers. Pink flowers such as carnations, geraniums and tulips convey a sense of innocence, while red flowers such as roses and tulips convey a sense of passion, desire and love. Finally, white flowers like roses, tulips, daisies and lilies all communicate reverence, elegance and luxury. Creating a flower arrangement depends on a harmony of colours and scents, but the colours of the flowers also convey strong messages. Understanding the language of coloured roses in particular and other flowers in general is imperative to help create flower arrangements that truly communicate what the sender is feeling. Brill article, I never thought about flower colours having a meaning. I will use this info next time I'm picking a flower arrangement for anyone. I knew that roses signified love - as they're everywhere on val day. But I didn't know that purple was the colour of royalty!